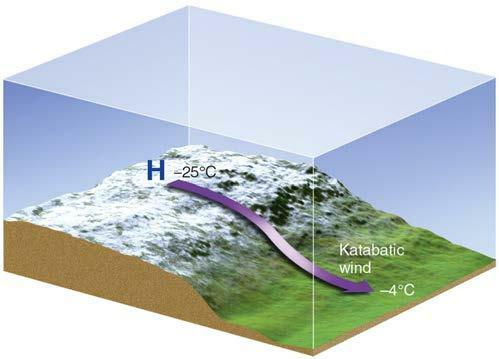 Katabatic wind is a dense cold wind that sinks down from high mountain plateaus to valleys below. It is described by Meteorologists as heavy cold air that practically mimics the movement of mountain water as it flows downslope and waterfalls over steep canyons. Depending on the temperature of the air it displaces during its descent, katabatic wind can become violent, reaching speeds up to 100 mph. Up on a high plateau of a mountain range, snow tends to be prominent during the winter months and into the spring. This snowpack keeps the air above it cold and dry. Air in the valley tends to be much warmer than the air on the plateau. To understand what makes this air start to move downslope, it is important to know the laws of temperature and pressure. Cold dense air is associated with higher pressure and warmer, less dense air is associated with lower pressure. Air tends to rise when it is warm and sink when it’s cool. Areas of higher pressure will move toward areas of lower pressure to try and replace the air that is lifted. The difference between areas of high pressure and low pressure is called a pressure gradient. The quicker the pressure changes, the stronger the pressure gradient. Therefore, the faster the air from the area of high pressure will move towards the area of low pressure. The cold, dry air above the surface of the mountain plateau forms a small area of high pressure. As the air in the valley gets warmer, it starts to rise. This causes that high pressure over the snow to move toward that warmer, lifting air. This cold, dense air will eventually move off the plateau. With gravity taking hold, it will start falling downslope, picking up speed as it falls into warmer and warmer air. There is nothing to hold it back as it slips down slopes and plummets over cliffs. Reaching speeds up to 100 mph, this cold air becomes a violent wind that can topple trees and damage crops. Although it can reach such speeds, katabatic wind isn’t always as violent of a wind. It can rage anywhere between 10 mph to 100 mph depending the pressure gradient from the top of the plateau to the bottom of the valley. The stronger the pressure gradient the quicker the air will sink and pick up speed. Katabatic wind is observed in many parts of the world with high mountain ranges and plateaus. You are most likely to experience katabatic wind in places northeast of the Adriatic sea that reside at the base of the Carpathian mountains, the Rhone Valley that sits at the base of the western mountain range in France, in Columbia at the base of the Cascade mountains, at Yosemite National Park in California and in places like Greenland and Antarctica. All these places where katabatic wind is observed, have other interesting names for the phenomenon. Areas south of the Carpathian mountains call it “Bora wind”, in France they call it “Mistral wind” and in Columbia they call it “Columbia Gorge wind”. Some areas see katabatic wind much stronger than others depending on the climate of the valley versus the elevational climates of the plateau it sits at the foot of. Although it may become a violent wind, in most cases some natives of areas that see katabatic wind describe their experience as a cold wind sweeping through that forces them to put on a jacket. In another instance, trees toppled over at a campground in Yosemite National Park injuring a park employee that was sleeping in a tent. Wind can be both enjoyable and dangerous depending on the circumstances. It is certainly interesting to learn that there are many different types of wind that have fascinating terminology associated with them. For more fascinating meteorology terms click here. What is a Pneumonia Front? ​The Great Lakes in the Midwestern United States go through many phases based on the various season that are experienced. In this part of the country, the calendar tells what season it is, but precipitable phenomenon (i.e. snow) can definitely occur outside of winter months. We will steer our focus on the effects the lakes have on surrounding areas in the early spring. After the lakes have spent the duration of the winter experiencing cold air temperatures and partial freezing, and we progress into spring where air temperatures warm up, the lakes are bound to have an effect on the surrounding land. The topic of discussion is somewhat of a slang term that came out of the Milwaukee National Weather Service office in the 1960s. The term Pneumonia Front refers to a sharp drop of air temperature on land of 16 degrees Fahrenheit in the period of an hour in the form of a cold front. Often times, the drop of temperature is generalized to 20-30 degree changes over the course of a few hours. This cold front moves inland in the form of a lake breeze and modifies the air around it, thus creating much cooler temperatures inland. A recent example occurred on March 24, 2017 where a day of strong warm air advection with high winds from the southwest led to temperatures rising to a very warm high temperature for March of 81 degrees. The average high temperature for the O’Hare International Airport station on this date is 50 degrees, according to wunderground.com. Right around noon, local time in Chicago, the winds turned to northeast and temperatures began to drop. Due to the significantly cold lake paired with the northeast orientation of the winds flowing over the lake, the effects of significant cooling were felt inland. Below is the 7-hour period of data that shows a quick temperature drop which drastically changed conditions in a short period. Figure: Historical Data from wunderground.com of observations on March 24, 2017 at O’Hare International Airport in Chicago, IL showing changes over a 7-hour period. Lake breezes are not uncommon, but definitely strong during the springtime period. Lake breezes will form due to significant temperature differentials between the land and lake, where air can be easily modified and brought inland. Lake breezes can form and noticeably cool an environment inland in the early spring, but progressing closer towards summer, both the air temperature and the lake will warm up, and the effect of a lake breeze will not be as significant. As summer begins and warmer temperatures are more frequent, a lake breeze can bring decent relief in temperatures during afternoon and evening hours, but is likely not to change an environmental temperature by 30 degrees. The effect of air modification due to a breeze from a body of water are also possible in other circumstances. For instance, Florida feels sea breeze that can modify weather conditions that usually lead to thunderstorms because of the great convergence over land due to two surrounding bodies of water being the Atlantic Ocean and Gulf of Mexico. Any sizable body of water near land can modify air around it. There have even been reports of breezes from rivers creating temperature fluctuations! ​Chances are, you’ve likely seen many rainbows in your life, whether it’s the classic bow shape of colors painted across the sky or just a quick glimpse of rainbow colors peaking through the spray of a sprinkler on a hot summer day. When white light from the sun hits a water droplet, some of the light is reflected while some of it is refracted, or bent, out of the droplet. The dispersion of the refracted light at varying angles can cause the appearance of the rainbow. While rainbows are something that we see during the day, a similar phenomenon occurs at night. Moonbows, also known as lunar rainbows, are formed in a similar manner to your typical rainbows, but with a different light source. When light that is reflected off of the moon’s surface hits moisture in the air, the white light can be refracted into the spectrum of colors that we typically see in a rainbow. However, since the light reflected from the moon is much dimmer than the light from the sun, moonbows will appear much fainter than their daytime counterparts. If you happen upon a moonbow, you may not be able to see the full spectrum of colors and instead may just see a faint white light. This is because the dim light is usually not enough to excite the cone color receptors in our eyes. 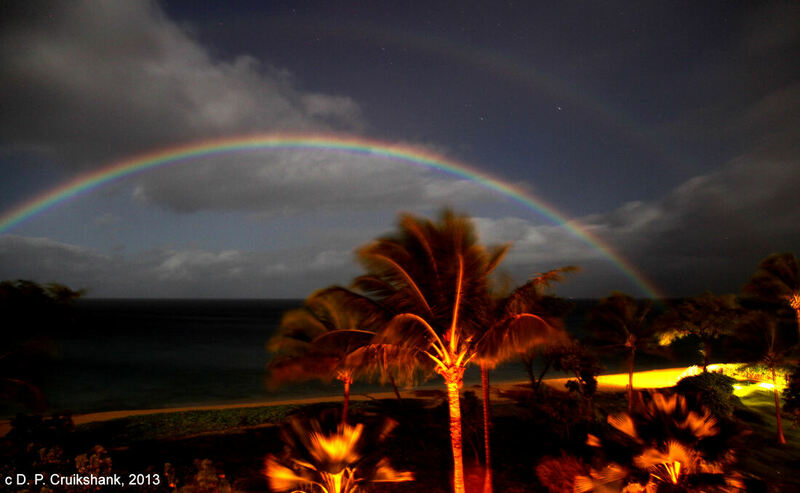 However, long-exposure photography can allow you to see the rainbow colors of a moonbow more clearly. ​I’ve always wondered what the difference was between each of these things that fell from the sky. After learning about them, there are so many differences between them! Do you know the difference between Graupel, Hail, or Sleet? Graupel is a snow particle (or snow pellet) that is irregularly-shaped. Graupel is formed when the snow pelts collect snow crystals, rian, or partially melted snow stick, like glue, to the snow pellet – which adds an icy layer on the outside. Graupel is usually no bigger than 5mm wide, and typically resembles a “chunkier” snowflake. Below is a picture of graupel. Hail forms in convective processes, like severe thunderstorms or cumuliform clouds. It can either be white or more of an opaque color and is considered to be bigger than 5mm in diameter (which is already bigger than any types of graupel). In order to be considered hail, it must form within a convective process which allows the growth of the ice. A good example of where hail growth occurs is within thunderstorm clouds. Within the upper region of the cloud, water droplets freeze together. When they start to fall from the cloud, the hailstones get pushed back up by the updraft of the storm. When the hailstone is pushed back up into the cloud, it comes in contact with more water droplets, which adds another layer to the hailstone. Eventually, when the hailstone becomes too heavy for the cloud to hold, it falls to the ground. 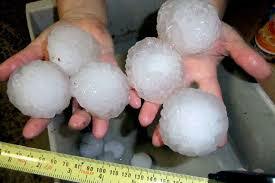 Below is a picture of hailstones. Sleet is different from hail because its translucent and is usually a ball less than 5mm in diameter. Sleet is formed by the refreezing of liquid raindrops or the partial melting of a snowflake. The best example of this is in the winter. When the precipitation from a storm falls as a snowflake, it will enter a warm pocket and completely melt until it hits a colder pocket of air near the surface and freezes as a ball of ice. When it hits the ground it will be a clear ball of ice, which is considered sleet. The main difference between sleet and graupel is that sleet is the re-freezing of liquid raindrops or partial melting of a snowflake, while graupel doesn’t re-freeze, but rather collects melted snow. Below is a photo of sleet. Now that you know the difference, I hope you’ll be able to recognize these when they fall from the sky. To learn more about weather education and other related topics, click here! Discussion: There are three stages of a thunderstorm: the cumulus stage, the mature cumulus stage, and the dissipating stage. Each stage are defined by certain characteristics and are outlined below. Air that is warmer than its environment will start to rise by convection during this stage. As this warm, moist air rises, it will cool and condense, thus forming a cumulus cloud. The updraft is very strong at this point so as the small raindrops try to fall, they get suspended and pushed up even further in the cloud. The raindrops begin to form larger raindrops as they collide with one another. The cloud continues to grow vertically and eventually reaches a height above the freezing level. At this level, supercooled water molecules exist, meaning that there is liquid water that is below the freezing point of liquid water. This allow for the water droplets to grow very large and fast. When they become large enough, they fall from the cloud and start the initiation of a cool downdraft. This leads to the second stage. This stage is characterized by the presence of both updrafts and downdrafts. As the air descends to the ground, evaporative cooling takes place. This is because the air below the cloud is still relatively dry which allows for the water molecules to evaporate. This cools the atmosphere. Sometimes this process can cool the atmosphere by as much as 20 degrees in 30 minutes. Evaporative cooling acts to further strengthen the downdraft. When the downdraft hits the ground, it has nowhere to go so it spreads out in all directions. This can sometimes cause minor damage to trees and houses. The cloud will continue to grow vertically as there is still a very strong updraft. The strong updraft will continue to push some of the water molecules way up into the higher parts of the cloud. This is usually when the anvil shaped cloud becomes visible. Hail is also formed at this point and intense cloud-to-ground lightning can be seen. As long as the updraft remains strong, hail will continue to grow in size. Once the hail is too large to be supported by the updraft, it falls to the ground. The downdraft will eventually cut off the updraft which is supplying the storm with the warm and moist air. When this occurs, the final stage commences. At this stage, the downdraft is prominent. The downdraft continues to cut off the warm and moist air that is needed for the storm to maintain itself. The anvil that is seen during the mature stage starts to flatten out as the storm continues to weaken and the latent heat, which is the energy that is released when the water vapor transitions to liquid droplets, process has been cut off. The once towering cumulonimbus cloud then turns into wispy, non-threatening clouds. This whole process takes about an hour but does vary with each storm. In some severe thunderstorms, the process can take several hours since the updraft is much stronger and can maintain the storm for a longer period of time. 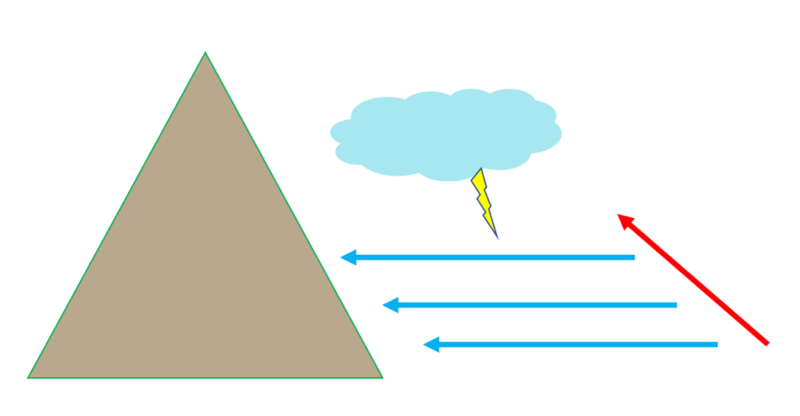 If the updraft is slanted, meaning that the thunderstorm is tilted as the height increases, as in the case for a severe thunderstorm, then the rain-cooled air cannot cut off the warm, moist air that is being brought up into the storm. This can cause the storm to maintain its strength for even longer. Astronomical Spring is here for those in the Northern hemisphere, and more “spring-like” weather is approaching. With the present Spring season kicking in comes an increase in the amount of solar radiation. This is because the Earth’s Northern hemisphere starts tilting more towards the sun on its axis bringing with it longer and warmer days. Since the land is getting warmer than the surrounding bodies of water, the differences in temperature can create localized pressure differences between them. Once this happens a phenomenon called a sea breeze can occur during the day, and a land breeze can occur during the evening. But what exactly is a sea and land breeze? Sea and land breezes are thermally forced circulations that occur from Spring to Autumn driven by differential surface heating. This means that the temperature differences between the land and water create areas of low and high pressure, and since high pressure always flows toward lower pressure a circulation forms to create the breezy conditions. Ideally the temperature difference between the land and water should be around 6-10 degrees Fahrenheit. The land is able to heat up much faster than water during the day while the water is able to hold in its heat better than the land during the night due to specific heat differences between them. Specific heat is defined as the amount of energy it takes to raise the temperature of 1 gram of water 1 degree Celsius. More simply, it takes water much more time to heat up than it does for the Earth’s surface. The specific heat of water is 1 calorie/gram degrees Celsius, or 4.186 Joules/gram degrees Celsius. This amount is roughly four times higher than the specific heat of land, which gives water this important characteristic and sets the stage for this thermally direct phenomenon. Notice the “cold front” indicated in the image above. This merely represents the cooler breeze flowing from higher to lower pressure. 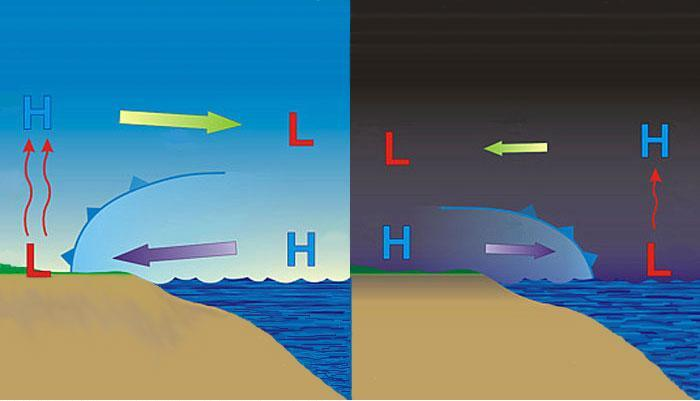 The sea breeze is shown on the left while the land breeze is shown on the right. This phenomenon does not only occur to oceans, but lake breezes also occur over smaller bodies of water such as the Great Lakes in the Northern part of the U.S. for example. However, these breezes can occur along nearly any coastal boundary around the world; a common location being the Florida peninsula. One of the main triggers of daily thunderstorm activity in coastal areas like this result from sea breezes that converge directly over the land. Having large temperature gradients such as these are often the main trigger to any convective development that can result from this mesoscale phenomenon. Forecasting for these events requires knowledge of the local synoptic and mesoscale weather forcings that can initiate this, the orography of the area, and the general shape of the coastlines. Are there calm, synoptic conditions such as an area of high pressure that won’t disrupt the flow? Are there concave or convex qualities to the shape of the land that could enhance or diminish the circulation? Is there a significant temperature difference between the water and the land? These questions can be helpful in deciding whether or not this type of phenomenon could occur. Sea and land breezes can have a large impact on local temperatures, making coastal areas or cities difficult to forecast for as these events are challenging to predict. During the day as the land heats up and a sea breeze is initiated, the temperature can be kept cool or significantly cooled as a result. The same goes for a land breeze. Once the sun goes down, the land cools off and the water is relatively warmer than the land initiating a land breeze. This can keep the air at a steadier temperature during the night and prevent the lake from warming the air onshore. What Must One Study to Obtain a Degree in Meteorology? What Does a Degree in Meteorology or Atmospheric Science Require? Maybe you’ve found yourself fascinated with the weather, endlessly gazing at the atmospheric ceiling, supine in the grass, eyes trained on the sky. Be it a newborn passion, or a lifelong fervor, he or she who decides to further this budding interest and develop it into a lifelong career may wonder what is required to surmount this goal and achieve it. As a starting point, there are many requirements to achieve an undergraduate degree in atmospheric sciences or meteorology, much of which involve the physical sciences. Seeing as the atmosphere acts as a fluid, moving and flowing, a strong backbone in physics and physical concepts is crucial to adopt and maintain a deep understanding of atmospheric behavior and movement, that then permits one to understand more advanced meteorological concepts. 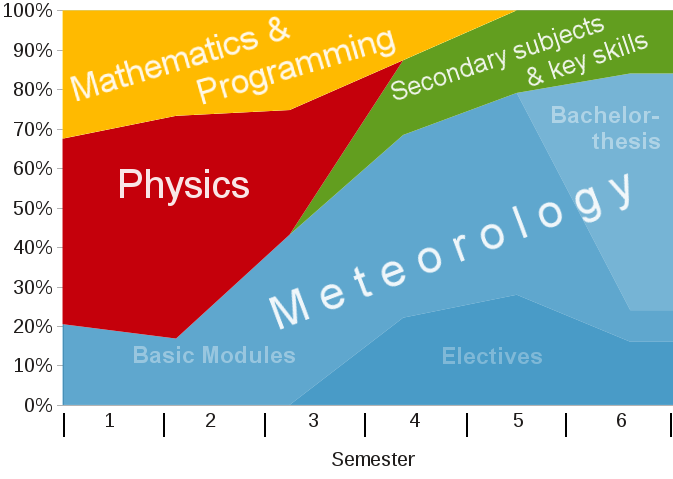 Many universities and colleges require undergraduates of atmospheric science to take and pass at minimum one complete series of Physics, or at least part of one. To supplement the understanding of physical and atmospheric concepts, a strong foundation in advanced mathematics such as calculus and linear algebra is mandatory. One must be able to solve and work through advanced mathematical equations and problems that will also more than likely present themselves within Physics courses. Physics has strong ties and correlations to concepts found within advanced mathematics, therefore placing the importance of needing to be able to work through higher level math problems. As a science that relies quite heavily on satellite and radar data, in addition to computer models and projections of atmospheric behavior, computer proficiency is another skill required by most meteorology or atmospheric science degrees. Many universities require an actual computer coding class be undertaken, though the extent to which knowledge of coding is preferred may vary depending on the program. Finally, a good grasp on chemistry concepts is also required of many undergraduate degree programs. The atmosphere is composed of different elemental gases and chemical compounds, so an understanding of how they may interact with one another and their formation or destruction under different environmental conditions such as heat and humidity is crucial. Great comprehension of chemistry topics is often beneficial especially for those that find themselves more interested in air pollution, a division of atmospheric sciences. Like most STEM degrees, a degree in meteorology or atmospheric science can be difficult due to the necessity of understanding of higher mathematical and physics concepts. However, it is simultaneously one of the most rewarding. One is not limited to giving the weather report on the five o’clock news, instead, one may find themselves specializing in atmospheric chemistry to monitor air pollution levels, climatology to monitor atmospheric changes and the overall climate of the earth, researching cyclogenesis and how tornadoes form, making weather predictions based off of computer forecasts and models, or even advising on legal cases for careers such as forensic meteorology! There is a wide swath of of opportunity for those intent on pursuing atmospheric science as a degree. Furthermore, one may branch into many different sectors with such a degree, be it broadcast meteorology, military, private, or public such as the National Weather Service. During weather broadcasts on television, the term of ‘Advection’ has been thrown into the mix usually when referring to a transfer of cold air or warm air into a specific region that will cause a variation in temperature. This explanation should help to understand the meaning of this term and its uses. Advection is defined as a transfer of some property by the atmosphere or ocean. This term can actually be very vague unless there is a description of what exactly could be transferred. Most commonly, you will hear terms like ‘cold-air advection’ after the passing of a cold front where cold air is transferred into your region (usually from the North, Northwest or Northeast) resulting in a drop in temperatures. On the contrary, warm-air advection refers to the passing of a warm front that causes a transfer of warm air into your region (typically from the South, Southwest or Southeast) and increase temperatures. While temperature is the most commonly paired term with advection, there are many more elements that can be transferred from one region to another. Wind can also aid in the transfer of more than just air temperature changes. Modification of air can refer to changing the humidity or dew point as well. Besides modifying the air with moisture, we can also see transfer of dirt, dust, salt or smoke. The purpose of tracking changes to air temperature help to determine how localized elements will change during a given time. For example, transfer of moist, humid and unstable air to a different region that leads to convective storms (severe thunderstorms and tornados) is essential to track the potential for severe weather. Timing of potential impacts is essential to residents planning a commute or maintaining their personal safety. Advection is a term that refers specifically to changes based on atmospheric or oceanic transfer. These are a few examples of what the term advection does not refer to: plowing snow from one area to another, watering your lawn, or salting an icy sidewalk or street. If there are calm conditions at a station, that also does not mean that temperature will not change. Radiative cooling can occur at night with no solar heating and under dry conditions, which allows for heat to radiate from the surface that results in a temperature drop. Solar heating can cause an increase in temperature during the day merely from the warmth of the sun and no interaction from wind. To learn more about other interesting weather topics and terminology, click here! ​Have you ever experienced a period of grey, wet weather that seems to drag on forever? While this can happen for a number of reasons, there is one phenomenon in particular that causes these weather conditions in mountainous areas. Residents of the southeastern US know this locally as “The Wedge”. The Wedge most recently affected areas of Northeast Georgia, near Atlanta and eastward towards South Carolina. It brought days of chilly, dreary, misty conditions. But what exactly causes the Wedge? The Wedge is more technically known as a Cold Air Damming event. Cold Air Damming, or CAD, happens when cold air gets trapped by mountain ranges. Low-temperature air is denser than air of a higher temperature, which means that cold air is effectively heavier, and is thus unable to rise up over the mountains and dissipate – so it gets stuck there for a few days. However, this layer of cold air is very shallow, confined to the part of the atmosphere that is closest to the surface. Above this layer of cold and misty air, conditions are much warmer. The arrows on the diagram above depict the direction of the winds coming towards the eastern side of the mountain, and the blue color depicts the cold temperature of the air that gets stuck near the surface. Because the colder air is very dense and confined to the surface, warmer air can get pushed above the cold air, as shown by the red arrow in the diagram. Rising air, and the energy associated with it, is what causes thunderstorms. As warm air rises and cools, water vapor in the air condenses into clouds. When this warm air rises quickly, all of that energy of motion causes a thunderstorm to develop. In the case of CAD events, warm air is able to rise quickly because it is being pushed against the heavier cold air and forced rapidly upwards. This is what was seen by residents of northeast Georgia in their most recent CAD event. There were many localized thunderstorms in the area caused by this phenomenon. These thunderstorms were brief, but brought torrential downpours and loud cracking thunder with them. The strength of these thunderstorms is a testament to just how strongly and quickly warm air is forced above the colder air when the Wedge/CAD is present. While Cold Air Damming can bring about some dreary, dismal conditions, it’s also a pretty interesting weather event. Next time you experience a few days of cold and mist, check your local weather maps for an area of cold temperatures near a local mountain range. You just might be experiencing Cold Air Damming!